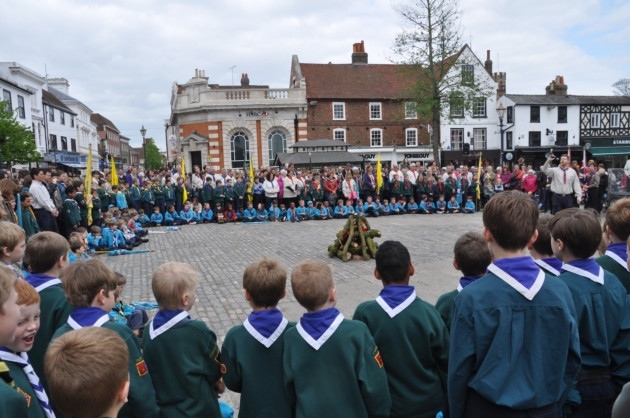 We joined with the rest of Hitchin District for our annual parade, followed by a camp fire in the Market Square (OK, no actual flames!) For the first time, our friends from Hitchin Guiding also joined us – which included the Christchurch units of course. For photos, see the Comet newspaper. Tonight at 11th Beavers we learnt a bit about grid references and this involved finding the co ordinates for Scooby Doo’s ears and tail! We’ve also got our battle ships games drawn out and ready to play next week as per Milton Bradley version of the rules. So life-jackets and rafts at the ready for next week! So did you know that Beavers (the animals that is) have orange teeth! This was one of the many interesting things that our Beaver Scouts learnt about Beavers when completing their challenge quiz of searching around the hall for the answers. 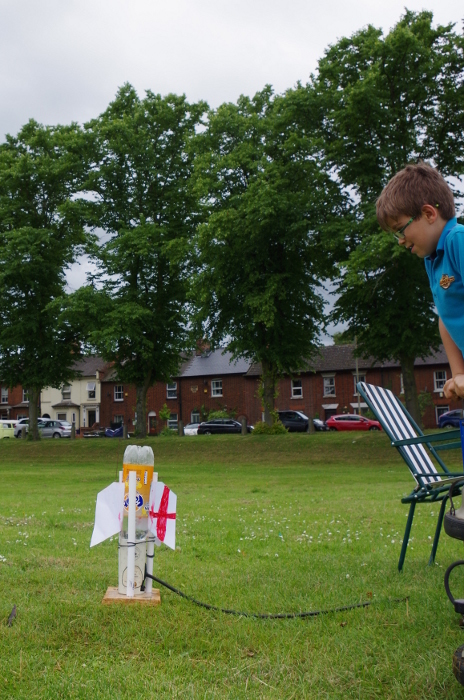 We also made Beaver face biscuits and tried out a new game – throwing balls to try and hit chairs and score lots of points. We welcome 5 new Beavers to our meeting and then at the end of our meeting we said good-bye to our 4 older Beaver Scouts as they ‘swam’ up to Cubs. 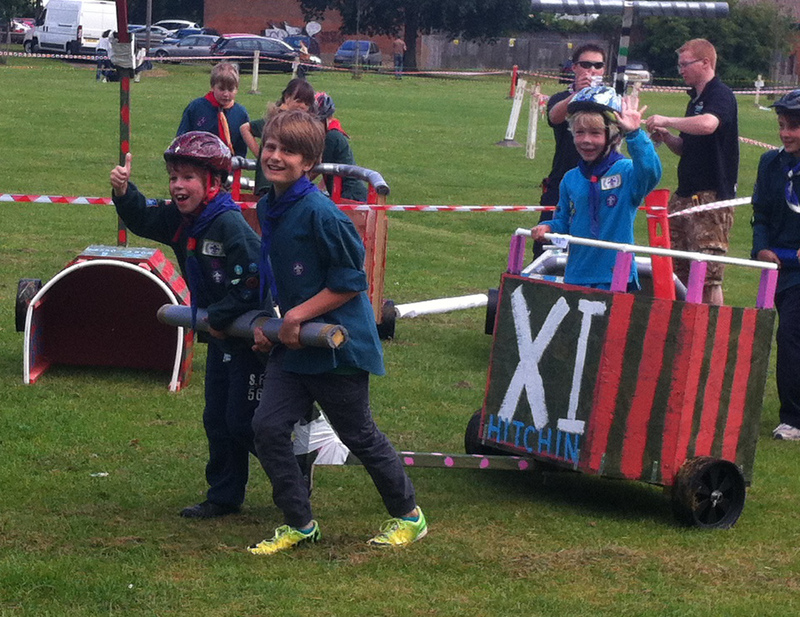 Our Beavers, Cubs and Scouts all took part in the District chariot racing. Our Leaders and supporters also entered the adult races. We didn’t win anything, but a great time was had by all. 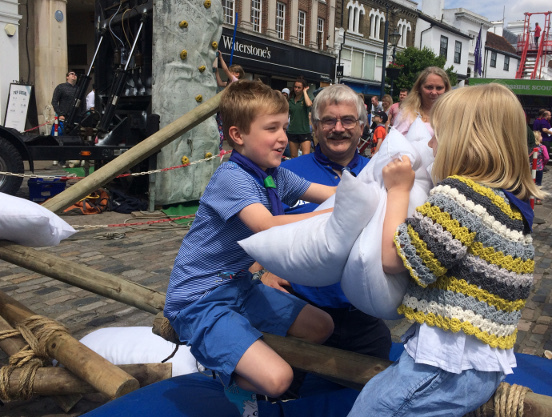 The feedback we’ve had so far is that everyone had a great time at DAW…..the weather was very good to us, maybe a bit too hot at times but we couldn’t have asked for better. Thanks to ALL the help we got as a group: drivers to/from Bromham, equipment movers, setting-up, striking camp, escorts and camp cooks. Without your help, we couldn’t have attended DAW anywhere as successfully. It was 11th Hitchin’s turn this year to lead the rest of the District in our annual St George’s Day parade – see the report in the Comet and also their photo gallery. The Parade was followed by a combined camp fire/service in the Market Square. We had a very successful day at our bag pack at the Iceland store in Hitchin. 5 shifts of leaders, parents with Beavers, Cubs and Scouts handed out baskets, packed shopping bags and loaded home deliveries. Everyone was impressed with their help and cheerfulness. We had collection buckets out for donations, and collected an amazing £406! Well done eveyone and thanks to Sue and Anthony from Iceland.